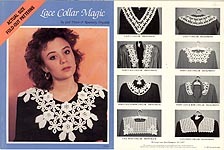 Lace Collar Magic, designed by Gail Diven & Rosemary Drysdale, Diven/ Drysdale, 1987. Gorgeous Irish Crochet designs -- instructions for Daisy Motif, Leaf Motifs, Circle Motif, and Irish Rose with Picots, along with a full- size pattern sheet for connecting motifs. Designs include: Irish Rose Collar, Lace Filet Collar, Lace V Collar, Daisy Lace Collar, and Daisy Lace & Rose Collar. Excellent condition. Sassy Lady, designed by Elizabeth Ann, nd. SEWING pattern for one scarf featuring a beaded fringe, and photos of 11 different looks from the one basic pattern. Excellent condition. 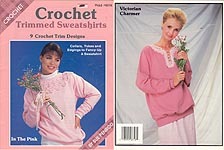 Crochet Trimmed Sweatshirts, designed by Sue Penrod, Plaid Enterprises, Inc., 1988. 9 crochet trim designs for collars, yokes, and edgings to fancy- up a sweatshirt. Very good condition. 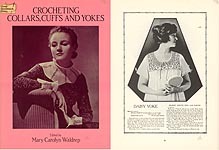 Crocheting Collars, Cuffs, and Yokes, edited by Mary Carolyn Waldrep, Dover Needlework Series, 1987. A collection of over 30 designs chosen from thread company leaflets of the 1910's to the 1950's, including a child's Peter Pan collar, a filet crochet yoke with a rosebud motif, ruffled collars and cuffs, yokes for child's dresses, ruffled jabot, and much more. May have marker on front cover, but otherwise very good condition. 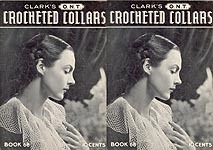 Clarks ONT Book 68: Crocheted Collars, The Spool Cotton Company, 1936. Gorgeous collars & cuffs, a Peter Pan Frill, a scarf, a Vestee, a crocheted tie, frills, fasterners, and clasps. Very good condition. 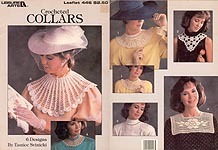 Designs by Elizabeth Hiddleson, Volume 49: Collars for Any Occasion, designed by Elizabeth Hiddleson, 1987. Five collars, sachet, and butterfly lapel pin. Excellent condition. 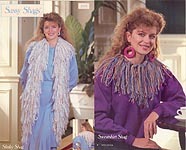 Sassy Shags, designed by Annie Potter, Annie's Attic, 1988. 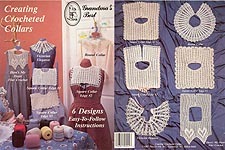 Digest- size booklet with instructions for 6 collar/ accent designs using a crocheted mesh base which is then fringed. Like new. Antique Collars, Annie's Attic, 1988. Digest -size book with 4 vintage designs: 1911 Yoke with Stock Collar, 1911 Point- De- Guise Collar, 1918 Filigree Motif Collar, and 1911 Puritan Collar. Three of these are reversible. May have paper clip mark, but otherwise like new. 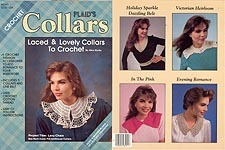 Plaid's Crochet Collars: Laced & Lovely Collars to Crochet, designed by Alice Hyche, Plaid Enterprises, Inc., 1987. 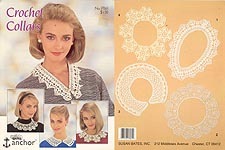 Patterns include 5 collars and one belt, using crochet cotton thread. Excellent condition. 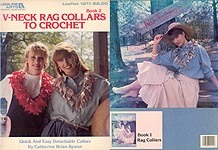 Crochet Collars, Susan Bates, Inc., 1987. 4 gorgeous designs. Like new. KNITTED Yokes for Sweatshirts, designed by Miriam Dow, American School of Needlework, 1987. 8 designs to KNIT in mohair or sport weight yarn. Shelf wear to cover; otherwise, excellent condition. 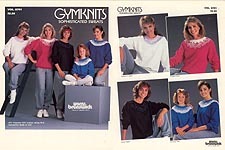 GYMKNITS Sophisticated Sweats, Brunswick, nd. 4 designs of KNITTED yokes for sweatshirts. Two have instructions for both adult and child sizes; two are adult only. Excellent condition. 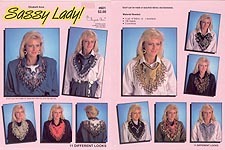 KNIT Collars, designed by Cathy Hardy, Leisure Arts, 1987. 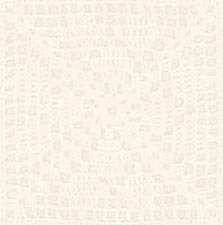 5 designs to KNIT in bedspread weight cotton. Former owner's name embossed on cover, but otherwise like new. 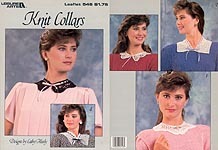 KNIT Collars, Book 2, designed by Geri Ballew Lewis, Leisure Arts, 1987. 4 designs to KNIT in bedspread weight cotton. Large store sticker on front cover, corners bent from mailing. Otherwise good condition. 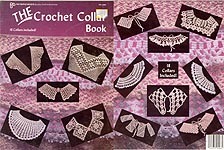 THE Crocheted Collar Book, Pat Depke/ Craft World Books, 1987. 18 collars from 6 different designers. Very nice book; multiple color photos of each collar. Some cover wrinkling, but overall good condition. 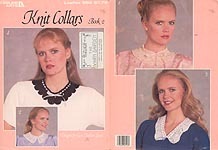 Knit & Crochet Collars, Annie's Attic, 1987. Designs include: KNIT Eyelet & Ribbon Collar, Scalloped- Edge Collar; CROCHET Pineapple Petals Collar, Lacy Pineapple Collar, Double Ruffle Collar. Digest-size book is like new. 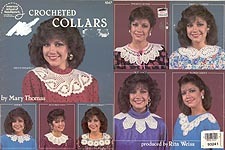 Crochet Collars, Annie's Attic, 1987. 10 designs in a variety of styles for women and girls. Digest-size book in excellent condition. Crochet Collars II, Annie's Attic, 1987. 6 designs in a variety of styles, including Filet roses , Love Knot middy, Picots, and lace.. Digest-size book in excellent condition. Crochet Collars III, Annie's Attic, 1987. 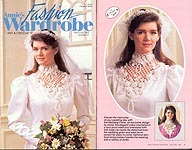 6 designs, including Antique Lace, Lacy Points, Scalloped, Flower Fantasy and Beaded Collars, and Love Knot Jabot. Digest-size book has check mark on cover but otherwiwse in excellent condition. Crocheted Collars IV, Annie's Attic, 1988. Gorgeous designs, including Lace Butterfly, Flower, White Collar, Popcorn Filet Collar, Irish Rose Collar, Lace Collar, Scalloped Edge Collar. Digest-size book in excellent condition. Crocheted Collars, designed by Mary Thomas, American School of Needlework, 1986. 8 designs. Like new. May smell very slightly perfumey. More Crocheted Collars, designed by Mary Thomas, American School of Needlework, 1987. 8 designs. Price tag residue on collar, but otherwise like new. May smell very slightly perfumey. 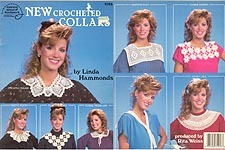 New Crocheted Collars, designed by Linda Hammonds, American School of Needlework, 1987. 8 unique designs in size 10 crochet cotton. Price tag residue on cover; otherwise like new. Crocheted Collars & Yokes for Sweatshirts, designed by Linda Hammonds, American School of Needlework, 1987. 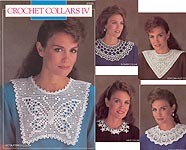 7 lacy designs in crochet cotton, with instructions for attaching to sweatshirt: Pinwheels, Floral Spray, Flower Lace, Ruffled Lace Collar, Medallion, Heartbreaker Fillet, Scalloped Shells. Excellent condition. Creating Crocheted Collars, Rauch Ind. Inc., 1987. 6 designs crocheted in size 10 cotton thread. Notes on two pages as to whom the collars were made for, but otherwise very good used condition. Lace Collars & Cuffs, Patons Crochet, nd. 4 pretty sets crocheted in size 10 cotton thread. Some shelf wear, but overall very good condition. 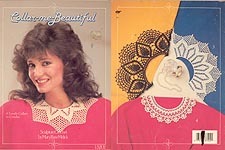 Collar- me- Beautiful, designed by Mary Buse Melick, Stella-Marie Publications, Inc., 1987 . 4 gorgeous designs. crocheted in size 10 cotton thread. Price crossed off on cover, but overall excellent condition. 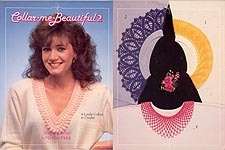 Collar- me- Beautiful 2, designed by Mary Buse Melick, Stella-Marie Publications, Inc., 1987 . 4 gorgeous designs. crocheted in size 10 cotton thread. Excellent condition. 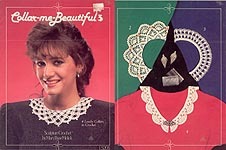 Collar- me- Beautiful 3, designed by Mary Buse Melick, Stella-Marie Publications, Inc., 1987 . 4 gorgeous designs. crocheted in size 10 cotton thread. Notes on one pattern; otherwise very good condition. Crocheted Collars, designed by Eunice Svinicki, Leisure Arts, 1986. 6 designs. May have slight page yellowing and cover bent from mailing, but otherwise very good condition. May smell slightly perfumey. Crocheted Collars, designed by Eunice Svinicki, Leisure Arts, 1986. 6 designs. SERIOUS CONDITION PROBLEMS: Entire pattern has been folded in half; check marks by all rows, cover & page wear, and red pencil used to mark some rows on the graph for the Filet Rose collar. All instructions present and readable. 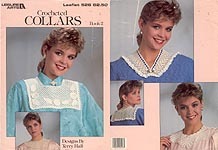 Crocheted Collars, Book 2, designed by Terry Hall, Leisure Arts, 1987. 4 designs. May be embossed stamp with former owner's name on front cover; otherwise, like new. May smell slightly perfumey. 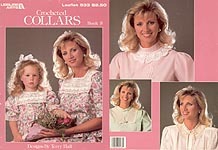 Crocheted Collars, Book 3, designed by Terry Hall, Leisure Arts, 1987. 4 designs, including one with variations for Mother and Daughter. May have embossed stamp with former owner's name on front cover; otherwise, like new. May smell slightly perfumey. 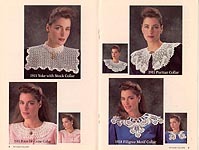 Crocheted Collars, Book 4, designed by Kay Fisher Meadors, Leisure Arts, 1987. 6 designs, including Sailboat Filet and Blossom collar that can worn square or v- shaped. All four corners bent from mailing, but otherwise very good ocndition. 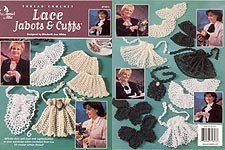 Lace Jabots & Cuffs, designed by Elizabeth Ann White, Annie's Attic, 1999. 6 matching sets crocheted in size 10 cotton thread. Like new. 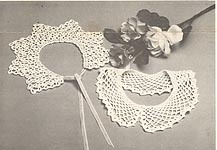 Crocheted Lace Collars, designed by Mary Thomas, The Pattern People, 1980. Black and white pattern sheet for 2 collars. This was a mail- order pattern sent in a size 10 envelope, so has 3 fold lines. Also some age- yellowing. Sweatshirts with Style, Annie's Attic, 1988. Designs include: SEW Cutout Collar; KNIT Rag Knit Collar, Ruffles & Ribbons Yoke, Western Fringed Yoke; CROCHET Striped Crochet Yoke, Filet Heart Sweatshirt, Music Note Sweatshirt. Heavy page yellowing; otherwise, very good condition. Lacy Collars and Cuffs to Crochet, Women's Day, October 1968. 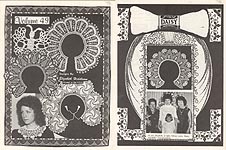 Digest- size booklet; designs include: Irish Rose Collar and Cuffs, Regal Queen Mary Collar and Cuffs, Picot- Edged Bertha, Frilly Filet Jabot, Ring Collar, Peter Pan Collar, Very good condition. 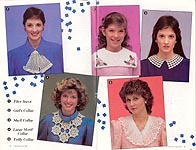 Classic Collars, The Crochet Catalog, 1987. Designs include: Pineapple Lace, Flower Motif, Rose Garden, Spanish Lace, Petal Collar, Heart Sailor Collar, Country Collar, Beaded Collar. Very good used condition. 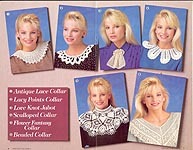 Classic Collars II, The Crochet Catalog, 1987. Designs include: Scallop Square, Love Knot Lace, Spider Web, Irish Rose, Victorian Shell, Mother & Daughter, French Knot Lace. Very good used -- may have former owner's name on inside front cover or small note written on one pattern. KNIT Yokes for Sweatshirts, designed by Catherine Brian Spann, Leisure Arts, 1987. Five different designs to KNIT. Very good used condition. 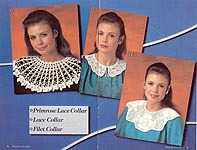 Design Line Knitted Lace Collars, designed by Shirley Evers, ForEvers, 1987. Instructions for 7 different designs to KNIT. Store sticker on cover, slight age- yellowing -- otherwise very good condition. Knitted Yoke Sweatshirts, designed by Shirley Evers, ForEvers, 1987. Instructions for 18 different designs to KNIT: Basic Design, 4 Neck Finishings (Ribbed, Garter St., Lower Neck, Rolled Neck Edge, RIbbed Collar), and variations including Stripes, Fair Isle, Placket Without Collar, Placket With Collar, Split Neck, Ribbed Yoke, Ribbed Yoke with Placket, Cables, and Color Blocks. Excellent condition. 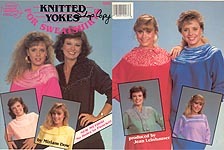 More Knitted Yoke Sweatshirts, designed by Shirley Evers, ForEvers, 1987. Instructions for 17 different designs to KNIT. Very good condition. Filet Crochet Collar, Coats & Clark Inc., 1987. Beautiful square collar. Former "give away" leaflet may have been folded several times, but otherwise is in very good condition. Stitch in Time Collars, Educational Bureau of Coats & Clark Inc., 1954. 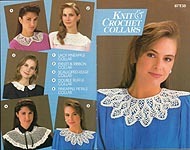 4 collar designs, one to crochet (Crochet Collar with Pearls) and three to sew (Pique, Linen, and Velvet). Some corner creasing and crinkling, but 1- page pattern is in overall good condition. Wendy Cotton 4 ply Crochet Collars, Carter & Parker Ltd, nd. Printed in England, so the measurements and stitches may not be quite the same as in the US. 6 designs. Like new. Knit-a-Bead/ Crochet-a-Bead Romantic Collars and Laces, designed by Gail Diven & Rosemary Drysdale, 1985. KNIT and bead lace insertion, 4 Edgings, a lace scarf, and 2 collars; CROCHET and bead 3 edgings with variations and 3 collars with several variations. Excellent condition. 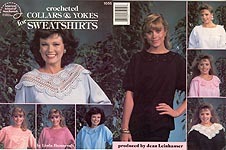 Crochet Keepsake Collars, Pat Depke Books, 1987. 5 collars and one lacy edging for fabric collar. "Fringed Victorian Collar" is very unusual. Some "shelf wear" on cover, but otherwise like new. 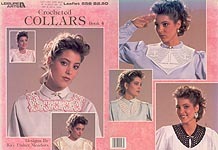 Crochet Neckline Accents, Pat Depke Books, 1987. Designs by Edna Blizzard include: Flower and Jabot Scarf, Daisy Squares, and Victorian Stars Bibs. Also included: Alice Helm's Mother & Daughter Tatted Collars, Rose Pirrone's Jabot, and "V" Collar by Linda Green. Very good condition. Crochet Collars & Vest, designed by Edna Blizzard, Pat Depke Books, 1987. 4 collars, one collar & cuff set, and an Heirloom Vest. Some "shelf wear" on cover, but otherwise like new. 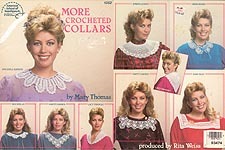 Crochet A Collar, designed by Betty Haddad Shelton, Creative Keepsakes, 1987. Five designs include: Initialled Square Bib Collar with Roses or Ivy, Hearts & Scallops Collar, Tailored Collar, and V-Bib Collar. Charted Alphabet included. Slight page yellowing, but overall excellent condition. Crochet Yokes for Sweatshirts, designed by Rheta Roach Lynch, Leisure Arts, 1987. 5 designs in worsted weight and specialty yarns. Top slightly bent from mailing, but otherwise excellent condition. 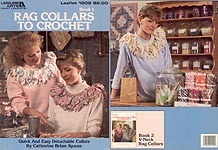 Ruffled Shawl Collar, Vanna's Afghan and Crochet Favorites, 1996. Pattern card from subscription series. Excellent condition, but may have faint smell of cigarette smoke. Collar Whimseys, Leaflet 2, designed by Nancy Bee, Barbetta Wood, 1987. 3 designs. Excellent condition. Crocheted Collars, Joan Henderson Designs, nd. 6 designs: Pineapple Points, V- Neck, Fan and Pineapple, Filet Flwoer and Pearl, and Square Neck. Price crossed off on cover and some corner wear, but overall very good condition. Crocheted Collars II, Joan Henderson Designs, nd. 4 designs: Shell and Post Stitch, Victorian Magnolia, Square Heart Filet, and Cape. Some shelf wear, but overall very good condition. Crochet a Collar and Choker, Volume 5, designed by Ruth Lafon Blythe, 1986. 6 lacy collars with matching choker necklaces in size 10 crochet cotton. Former owner's address sticker on front cover, slight spine wear, but otherwise very good condition. Crocheted Heirlooms Square Motif Collars, designed by Helen Haywood, 1986. 2 collar designs in size 10 or 20 crochet cotton. Motifs can also be used for doilies, frames, placemats, funners, bedspreads, etc. Tag smudges on cover, but otherwise excellent condition. Crocheted Heirlooms Pineapple/ Fan Collars, designed by Helen Haywood, 1986. 2 collar designs in size 10 or 20 crochet cotton, one with matching cuffs, and variation for one collar using mohair yarn. May have slight page- yellowing -- otherwise, excellent condition. Crocheted Heirlooms Pineapple/ Fan Collars, designed by Helen Haywood, 1986. 2 collar designs in size 10 or 20 crochet cotton, one with matching cuffs, and variation for one collar using mohair yarn. 2- hole punched for binder, slight page- yellowing -- otherwise, excellent condition. Crocheted Heirlooms Pineapple Collars, designed by Helen Haywood, 1986. 3 designs in size 20 crochet cotton. One of these may also be used as Yoke, Wreath, or Frame (shown on straw hat). Very good condition. Crocheted Heirlooms Quick & Easy Collars, designed by Helen Haywood, 1987. 3 designs, one each for use with size 10 or 20 crochet cotton, or mohair. Some staining on back cover -- looks like it might be age- tanning. Overall good used condition. Crocheted Heirlooms Middy & Filet Collars/ Cuffs, designed by Helen Haywood, 1986. Versatile, reversible designs in size 10 or 20 crochet cotton. Very good condition. Crocheted Heirlooms Lacy Treasures Collars, designed by Helen Haywood, 1985. 4 designs made with size 10 or 20 crochet cotton, or mohair. Tags or price crossed off on cover, slight age- yellowing; otherwise, excellent condition..
1-Day Collars, The Crochet Catalog, 1988. 6 fashonable wardrobe accents in crochet cotton. Like new. Lace Collar, Marshall Cavendish LTD, 1985. Digest- size leaflet from a subscription club. Floral Motif detachable collar could also be used as an insertion youke for a dress, blouse, or nightgown. Like new. Lace Collar & Cuffs, Marshall Cavendish LTD, 1985. Digest- size leaflet from a subscription club. Like new. Detachable Collar, Marshall Cavendish LTD, 1988. Digest- size leaflet from a subscription club. Shell lace collar ties with a ribbon in back. Like new.